What Facts Should I Know about Macular Degeneration? What Are Macular Degeneration Risk Factors? What Are Macular Degeneration Symptoms and Signs? What Exams and Tests Do Doctors Use to Diagnose Macular Degeneration? Are There Home Remedies for Macular Degeneration? What Is the Treatment for Macular Degeneration? What Is the Prognosis of Macular Degeneration? What Are Macular Degeneration Complications? Are There Ways to Prevent Macular Degeneration? The diagnosis of macular degeneration is becoming increasingly more common due to patient awareness, physician access, and improvements in tools for detection. Additionally, because of the increase in our elderly population, there has been an increase in the percentage of the population at risk for this condition. Macular degeneration is a formidable challenge to patients, their doctors, and our society as the costs for delivering state-of-the-art care increase. What is the medical definition of macular degeneration? Macular degeneration, also called age-related macular degeneration (AMD or ARMD), affects the macula, which is the central portion of the retina of the eye. Our central vision (what you see directly in front of you rather than what you see at the side [or periphery] of your vision) is dependent on a healthy macula. The retina is a layer of tissue inside the eye consisting of the receptors and nerves that sense and transmit light signals from the eye to the optic nerve. From there, the optic nerve sends the information to the brain for interpretation as our sense of vision. The macula is the very central portion of the retina and is responsible for the detailed vision that we use to read, thread a needle, sign a check, or recognize faces. Age-related macular degeneration is the leading cause of blindness in people older than 50 years in the United States affecting more than 2 million people. Because overall life expectancy continues to increase, age-related macular degeneration has become a major public-health concern. Dry form: This type results from the gradual breakdown of cells in the macula, which can result in a gradual blurring of central vision. 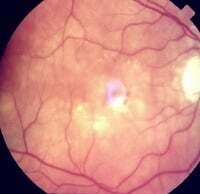 Small, round, yellow-white spots called drusen accumulate under the macula in the dry type. Drusen can be seen by your doctor using standard eye exam equipment. Drusen can become visible at any age, but are much more common in people over the age of 55. Many people with drusen alone have excellent vision and no symptoms. A small percentage of people, however, will go on to develop an advanced form of dry AMD known as geographic atrophy (GA), in which the macular tissue gradually thins. When this occurs, there can be vision loss ranging from mild to profound. Wet (exudative or neovascular) form: In the wet form of AMD, abnormal blood vessels grow under the macula. These blood vessels may leak fluid or blood, distorting or diminishing central vision. Wet AMD usually starts in one eye and may affect the other eye later. In contrast to the dry type, vision loss may be rapid. Wet macular degeneration affects only 10%-15% of people who have AMD but accounts for the majority of people who have significant visual loss. Juvenile macular degenerations (for example, Stargardt disease) are uncommon inherited macular diseases of childhood that are not discussed here. Age-related macular degeneration. 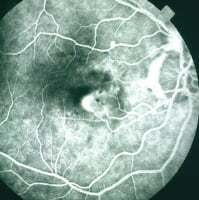 Retinal photograph. 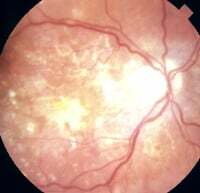 Dry type with drusen (spots) and atrophy of retinal pigment epithelium, right eye. Courtesy of Dr. James Puklin and Dr. Dean Elliot. Age-related macular degeneration. Dry type, fluorescein angiography. Courtesy of Dr. James Puklin and Dr. Dean Elliot. Age-related macular degeneration. 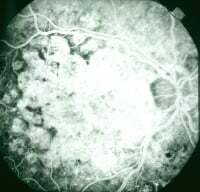 Retinal photograph. Wet type with blood. Courtesy of Dr. James Puklin and Dr. Dean Elliot. Age-related macular degeneration. Fluorescein angiography, showing a choroidal new blood vessel membrane. Courtesy of Dr. James Puklin and Dr. Dean Elliot. Age-related macular degeneration. Wet type. This fluorescein angiogram shows leakage of fluorescein from a choroidal new blood-vessel membrane. Courtesy of Dr. James Puklin and Dr. Dean Elliot. Many forms of AMD are hereditary (genetically inherited), but because symptoms may not appear until later years, obtaining an accurate family history may be difficult. Age: The likelihood of developing macular degeneration increases with age. Smoking is a risk factor for both forms of macular degeneration, and smokers with AMD suffer more severe vision loss than nonsmokers with AMD. Cardiovascular disease, high cholesterol, hypertension, and metabolic syndrome are also associated with AMD. Race: Macular degeneration is more common in whites but occurs in all races. Pigmentation: Macular degeneration is more common in people with lightly pigmented skin and light blue eyes. Gender: Women get AMD more commonly than men. What can I do to decrease my chances of losing vision? What low-vision aids are available to help me with my remaining vision? How can I improve my overall cardiovascular health? How can I get help with smoking cessation? Distorted vision (metamorphopsia): Straight lines may appear wavy or bent. AMD is not associated with redness of the eyes or pain. There are no outwardly visible signs of AMD in the eye. An eye doctor will be able to see signs of AMD by examining the retina with special equipment. The signs may include irregular pigmentation, yellowish deposits, and fluid and/or blood in or under the retina, as discussed below. In general, people older than 45 years should have a complete eye examination with an eye doctor (ophthalmologist or optometrist) every one to two years to screen for AMD, as well as other eye conditions (such as cataracts and glaucoma) that become more common with age. People with a known family history of AMD should be checked yearly. Once a person is diagnosed with AMD, more frequent follow-up examinations may be needed. Additionally, the eye doctor will ask patients with AMD to monitor their vision at home using a tool known as an Amsler grid. If changes in vision are detected using the grid, patients should promptly notify their ophthalmologist. Timely treatment of early wet age-related macular degeneration can often prevent further vision loss. An eye doctor will begin with a complete eye examination, which will include asking about any changes in vision and any family history of eye disease. Initial tests include measurement of the sharpness of vision (visual acuity) and an examination of the retina. During the examination of the retina, the ophthalmologist looks for specific signs of macular degeneration. Drusen and irregularities in the pigmentation of the retina are the hallmark signs of dry AMD. Drusen come in different sizes. Large drusen are associated with higher risk of vision loss than smaller drusen. 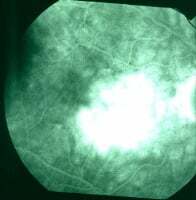 Thinning (atrophy) of the pigmented layer of the retina is seen in advanced dry AMD (geographic atrophy). Often it is helpful to take a photograph to document the findings and refer back to the image at follow-up visits to detect any subtle progression of the condition. The eye doctor will also look for signs of wet AMD, which can include the presence of exudates (fluid), blood, or an elevation in the retina that hints at the presence of abnormal blood vessels forming behind the retina. Additional imaging is often used to study the changes in more detail. OCT (optical coherence tomography) is used to detect and better localize drusen and fluid in and behind the macula. Fluorescein angiography (FA) is used to measure the size and extent of abnormal blood vessels. In this study, a dye (fluorescein) is injected into the arm. Then a series of photographs are taken of the retina as the dye passes through the retinal vessels. This test can help guide treatment of wet AMD. Supplements: In a landmark national study conducted by the National Eye Institute, people with moderate and advanced age-related macular degeneration were shown to significantly benefit by taking a dietary supplement containing certain vitamins and minerals. The supplement is known as the AREDS2 formula and is available over the counter. It slowed progression of disease in many cases. Unfortunately (and somewhat surprisingly), the same supplement did not prove to be of benefit in preventing progression in those who had mild AMD, nor did it have any significant effect on the development of AMD in people who started out with no disease. The definition of mild, moderate, and advanced disease was based on the retinal findings (for example, size of drusen) and other factors. An eye doctor will tell you if AREDS2 vitamins would be of any benefit. Diet: Though the AREDS2 supplements were not found to be helpful for all AMD patients, several studies have shown a clear association between the severity of AMD and diet. Diets high in vegetables, fruits, and omega-3-rich foods and low in sugar are associated with less progression and severity of AMD. Smoking cessation is important for everyone with AMD. Smoking accelerates the progression of vision loss in AMD. In addition, smoking can worsen other eye conditions, including dry eye cataracts, diabetic retinopathy, and glaucoma. Exercise: Regular exercise can help maintain good cardiovascular health, which is important as many studies have demonstrated an association between poor cardiovascular health and more advanced forms of AMD. Your eye doctor will instruct you to monitor your vision at home with an Amsler grid. If you use corrective lenses (bifocals, contact lenses) for reading, wear them for the test. Hold the grid 12 to 15 inches away in good light. While looking directly at the center dot with the uncovered eye, note whether all lines of the grid around the dot appear straight. Note any areas in which the lines appear wavy, distorted, bent, blurry, or dark. If any area of the grid appears wavy, distorted, bent, blurry or dark, contact your ophthalmologist. This could be a sign of worsening AMD, and prompt evaluation is important as earlier treatment has higher chance of success. As mentioned above, the AREDS2 vitamin/mineral supplements may help slow down the progression of moderate to advanced AMD. Your eye doctor will determine if you are a candidate. For dry AMD, including geographic atrophy, there are no standard treatments currently available, however, research is under way and many promising experimental treatments are currently being evaluated. For the wet form of AMD, there are treatment options. Your eye doctor will refer you to a retina specialist (an ophthalmologist who has done additional specialized training in treatment of retinal diseases). A class of medications known as anti-VEGF (anti-vascular endothelial growth factor) can help shrink or even eliminate the abnormal blood vessels that form under the macula in wet AMD. These include ranibizumab (Lucentis), bevacizumab (Avastin), and aflibercept (Eylea). They are injected into the eye directly, and often several injections are necessary over the course of months or years. Anti-VEGF therapy has had a high success rate in stabilizing or reversing the abnormal vessels, and many patients experience improved vision, as well. Laser treatment: Laser treatment to the affected areas used to be a common therapy; however, the success rate was mixed. Photodynamic therapy is another type of laser treatment in which a lower-energy laser is used after pretreating with an intravenous medication (verteporfin [Visudyne]). With the success rate current anti-VEGF therapy, laser therapy is used less often today. In all cases, the success rate of therapy is dependent on timing. The earlier the condition is treated, the higher the likelihood of success. This is why regular checkups with an eye doctor to detect AMD and close monitoring of vision with the Amsler once AMD is found are very important. If a large amount of blood accumulates in or under the retina, there may be a role for eye surgery to remove the blood, and in some cases, the abnormal blood vessels themselves. Surgical options include pars plana vitrectomy (surgical removal of the vitreous gel in the eye), retinotomy (a small incision in the retina to access the trapped blood), or placement of a gas bubble, sometimes in combination with administration of anti-VEGF and blood-thinning medications (for example, tPA). A retina surgeon will determine which procedure might be indicated, depending on size and location of the vessels and blood, among other factors. Prognosis is highly variable. The prognosis is generally worse for those with a strong family history of AMD and those who develop either geographic atrophy or wet AMD. In wet AMD, abnormal vessels can ooze blood under, in, or in front of the retina. The presence of the blood itself can cause further damage to the retina, thus necessitating prompt treatment when appropriate. Some patients develop double vision if the abnormal vessels distort or drag the macula, resulting in a shift of the image seen in one eye. Legal blindness (vision of 20/200 or worse with glasses) develops in a minority of AMD patients. When it occurs in both eyes, however, it, of course, has a huge impact on one's lifestyle. Because some people with the dry form of macular degeneration may develop the wet form, those with the dry form should monitor their vision daily or at least weekly with the Amsler grid and notify their ophthalmologist of any changes in their vision. Your eye doctor will ask you to return for repeat examinations. The frequency of these visits will depend on your risk factors. Pictures (photographs and OCT imaging) are often taken to keep track of the macular changes. Patients who have undergone treatment for the wet form of the disease should continue to monitor their vision for signs of recurrence. Unfortunately, there are no known ways to prevent AMD at this time; however, there are many steps one can take to decrease the severity of the disease. Regular eye examinations to detect AMD in its earliest stages are important. And follow-up visits together with home monitoring of the vision with the Amsler grid is especially important in people who have been diagnosed with AMD. If you smoke, stop. Smoking is associated with worse vision loss in AMD. Smoking is also associated with worsening of other eye conditions such as cataracts and glaucoma. A balanced diet that includes plenty of vegetables and low amounts of sugar is associated with better eye health. Protecting the eyes from the sun's ultraviolet (UV) light with sunglasses that block UV rays may also help decrease the severity of AMD. Additionally, the UV-blocking sunglasses help protect against skin cancer on the eyelids' skin. Ask your eye doctor if you should be taking the Age-Related Eye Disease Study (AREDS2) vitamin supplements. A recent study implied a correlation between aspirin use and AMD, however, since then many other studies have demonstrated no correlation, and the overall benefits outweighed the risks for those who were prescribed aspirin for cardiovascular health. People with vision loss from AMD may benefit from low-vision aids such as handheld or stand magnifiers for reading and telescopes incorporated into specially designed glasses to see into the distance. In addition, talking watches, computers that use large type face, and many other specialty devices are available. Rastogi, N., and R.T. Smith. "Association of age-related macular degeneration and reticular macular disease with cardiovascular disease." Surv Ophthalmol 61.4 Jul-Aug 2016: 422-433. Stanescu-Segall, D., F. Balta, and T.L. Jackson. "Submacular hemorrhage in neovascular age-related macular degeneration: A synthesis of the literature." Surv Ophthalmol 61.1 Jan-Feb 2016: 18-32. Thornton, J., R. Edwards, P. Mitchell, R.A. Harrison, I. Buchan, and S.P. Kelly. "Smoking and age-related macular degeneration: a review of association." Eye 19.9 Sept. 2005: 935-944. What treatment has been effective for your macular degeneration? What symptoms did you experience with macular degeneration?